Back in December of '06 I wrote the following post which I still stand behind today. I am rerunning it because I feel some messages need repeating plus it will help when I post about Santa Claus later. Rudolph the Red Nose Subliminal Message? This is a common character at Christmas these days. Thousands...no millions of remakes of his song, movie, etc. fill the Holiday air. There are many children and adults who love this little red nose guy. He is a rival in popularity to Frosty the Snowman. Cute, red nosed and oh so innocent, he barges through life with that glowing orb for a sniffer and then ends up saving the day. He battles societal disdain but triumphs in the end. He is such a great Christmas character....or is he? He is actually a subliminal message on how corrupt our societal concept on popularity, acceptance, and individualism really is. Think about his story: Rudolph is born much to the excitement of his "popular" father, but then disappointment when his son is abnormal. (not abbie normal) His father spends the next bit trying to cover the abnormality so that his son can "fit in" and be like the other reindeer. Instead of being proud of having a son and teaching his son self confidence with his red nose, he shows his shame and projects it onto his son. So then Rudolph is sent out into the "world" persay with a tiny self-esteem and the tension of shame underlacing his actions as he tries to hide that he is different. The other reindeer children, of course, find out that he is different and since he does not have the self confidence to turn the situation to his favor they shun him and he is hence an outcast. Fast forward to that foggy Christmas eve (amazing there was never a foggy Christmas eve before Rudolph came into the world) and here comes who? The Big Wig. The Top dog. The CEO of the North Pole - Santa Claus. He, having never been in the picture before because he was too busy running the north pole to notice, suddenly realizes that this abnormal outcast might be useful to keep his reputation intact and his schedule on time so that he can get home before Mrs. Claus begins to fuss because they have a tightly schedule trip to the Bahamas this year. So being the entrepreneur and diplomat that Santa is...and you know he is (More on this in my new post coming soon...) goes to the outcast seeing much opportunity and asks if he will guide the sleigh. Santa was not being nice this was more free labor and his problem of the fog solved, plus what outcast would refuse the gleaming chance to be popular? So Rudolph, just like Santa knew, jumps at the chance to be the hero and be popular. Hooray, he saves the day and then everyone likes him. They are all happy, joyous, and a bunch of hypocritical snobs! It wasn't until the Big Wig Santa turned his attention on Rudolph that suddenly he was worthy of societal attention and friendship. Does this not ring throughout the entire story? This story bleeds the message that if someone is different it is socially acceptable to shun them and only if they are lucky enough to have someone oh so popular (like Santa) pay them heed do we need to accept them. 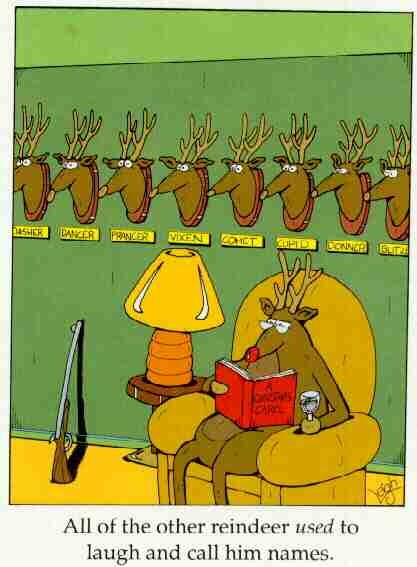 So hence, I do not like the story of Rudolph the Red Nosed Subliminal Message, nor his song! Do you look at the story differently now? I agree with your post. It actually reflects our society very well -- especially at the childhood level. I remember I was just another kid at school until a couple of the popular kids became my friends. After that, I was everyone's friend.